My oldest son, Logan, is on the Autism Spectrum, though he has grown and matured and is now more adaptable to various settings. We still feel as though we are sometimes limited on what environments he will tolerate or for how long. I have often talked about my internal struggle with guilt that my younger son, Zane, has to live under the "Autism Umbrella". Thankfully he doesn't know any different though, this is his "normal". Watching his brother go to various therapy appointments or special camps where he goes on various field trips to learn social skills has sparked a bit of jealousy from time to time. To offset that jealousy I like to have a special day with my younger son that we call a Mommy Date. I give him a few choices of things that we can do, often times choosing things that I know Logan wouldn't tolerate. 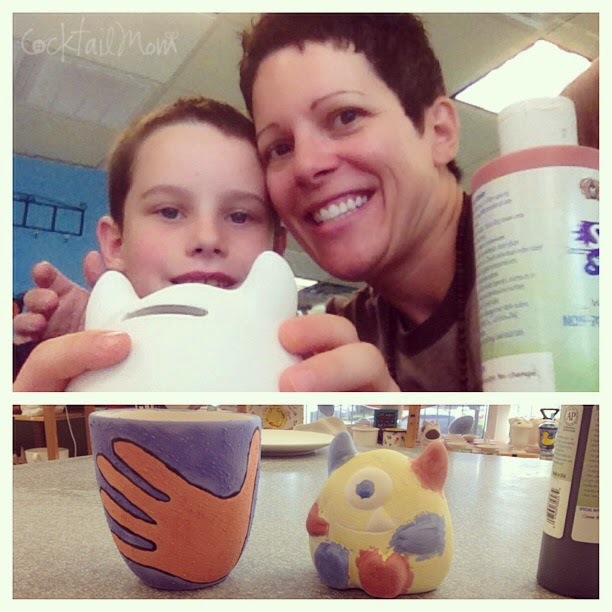 Recently we went to a paint your own pottery type of place and enjoyed talking while painting our pieces of pottery. I chose to do a large mug and I traced Zane's hand on it so now I have a special mug that I can use with my morning coffee to remind me of our special Mommy Date. Carve out some time for each of your kids, you don't have to spend money or go somewhere new. Take a walk around the block, or lay in the hammock together. The important thing is to talk, to truly listen to just that child and offer them your undivided attention. Turn off the phone and other distractions and tune into that sweet child.